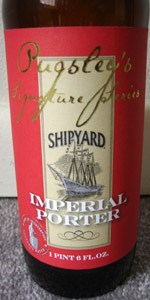 A full-bodied, very dark, malty beer with a good roasted character. The beer has an OG of 1.070, rounding out after fermentation with just a slight residual sweetness and cutting dry at the finish. Cellared 5 plus years. A little concerned that the ABV is a little low for it being cellar for 5 year. A massive two finger head with okay retention. The head is medium light tan head that is rocky and foamy. The color of the beer dark brown with some reddish brown hues. N: A nice dark roasted malt with coffee, chocolate, so port notes, raisins, molasses, and dried figs. T: A rich roasted malt with coffee, chocolate, port, raisins, bread, molasses, dried figs, yeast, and earthy. M: A strong carbonation, medium body, slightly creamy. This is far better than the barleywine that I tried a few days ago. It is a good example of baltic porter, I can taste the age on the bottle. I think I pushed it a tad too far. A good beer nonetheless. Cellared 2 years. L: deep brilliant chestnut, 2” tan finely bubbled foam cap, moussey and persistent head S: a touch of sherry and over ripe fruit T: Caramel, not a lot of roast, some intense creaminess, hints of cola and chocolate, traces of pepper. F: medium high carbonation, medium to medium full body O: A big, interesting porter that handles 2 years in the cellar quite well. Another of Shipyard's Signature Series, the XXXX IPA, is one of my very top rated brews, so I had to pick this one up to try. Plus it was half price. No date visible. If it's not a recent product perhaps the hops are underrepresented. Poured from the 22 oz. bottle into a stemmed tulip glass. a: Black with hints of clear ruby when held to light,. Inch thick tan head receded quickly to thin surface foam and spotty lacing. t: Smoke builds along with sharp bitter notes which linger on the back sides of the tongue. Later the smoke becomes muted and mild hints of dark fruit and malt emerge. m: Light to moderate. Very smooth once you get past the hop bite. o: An easy drinking and flavorful porter with a good malt profile and hop bite, if perhaps a bit mild compared to some of today's Imperials. Needs to be around the suggested 55 degrees or warmer to taste its best.